The educational mission of the Center for Global Awareness is to provide holistic, globally-focused, and culturally-enriched books and resources for educators and students grades 9-university. The increasing complexity and interdependence of the world today calls for different approaches to teaching and learning. In response to this need, we—Denise Ames and Nancy Harmon, founders of the Center for Global Awareness—have researched, experimented with, and discussed at length what we think is the most insightful approach to take in creating our educational resources. Drawing upon our more than six decades in the education field, our wealth of cross-cultural travel experiences, our concern for the education of young people, and our alarm at the direction of the United States and the world, we feel passionate about designing books and resources infused with a holistic approach and global perspective. Our books and educational resources are an engaging alternative curriculum rather than a "one-size fits all" world of standardized testing and corporate textbooks. These materials have been thoughtfully designed for educators and students in grades 9 through university. With most educational resources coming from the for-profit world, along with a hefty price tag, these very affordable resources are sold through our non-profit organization, the Center for Global Awareness, whose mission is to provide affordably priced and stimulating educational resources. As veteran educators, we are able to write freely about and interpret global topics and world history without constraints of whether the book will meet profit goals of corporate investors. 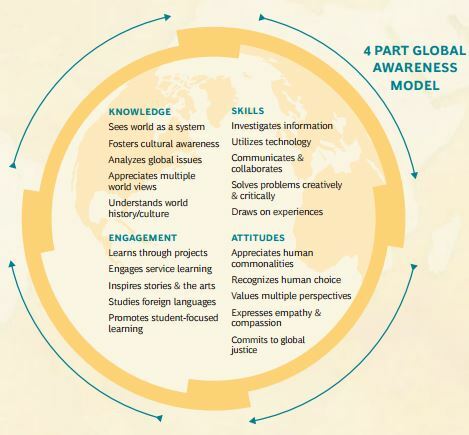 Educators will find this standards-based curriculum especially helpful in teaching about global issues, cross-cultural topics, holistic world history, and in globalizing their curriculum. Students will find this approach connects topics such as history and global issues to their everyday lives in a meaningful way. What is our Educational Curricula? The curriculum is designed for educators, students in grades 9-12, college undergraduates, and the general reading public. These thought-provoking and timely books systematically explore a range of critical global issues, engaging cross-cultural topics and holistic approaches to history. The series has teacher resources guides, activities, and links to additional resources. Dr. Denise R. Ames draws upon her extensive teaching experience, far-reaching world travels, and careful research in developing an alternative, holistic, globally-focused approach to world history, the global economy, human rights, and significant global topics. She has over 30 years teaching experience in secondary schools, a community college, universities, professional development training, and public speaking. She is the founder and president of the Center for Global Awareness, author of seven books and blogs regularly for CGA. Nancy W. Harmon, MA, draws on her 30 years in different teaching capacities to add a multi-cultural and global perspective to the CGA curriculum. Her book, International Folktales for English Language Learners, was inspired by her students' delighted response to the folktales from around the world she used to teach English language skills in U.S. classrooms and abroad. It is developmentally organized for high beginning through intermediate students and offers comprehension, vocabulary and sentence building exercises as well as lively communicative activities. Who is the audience for our curriculum? The curriculum is thoughtfully designed for educators and students who wish to add a holistic, alternative approach to their social studies curriculum or other programs. Educators will find this curriculum especially helpful in teaching about current events, cross-cultural topics, holistic world history, and globalizing their curriculum. Students will find this approach links topics such as history to their everyday lives in a meaningful way. 1. Envisions new paradigm thinking and learning. 2. Uses a holistic approach. 3. Infuses a global perspective. 4. Sees through a big picture lens. 5. Draws on transdisciplinary knowledge. 7. Encourages openness and world-mindedness. 8. Imagines the world as an interdependent web. 9. Connects topics to real life education. 10. Inspires students and educators to action. 11. Places the environment as the nexus. 12. Challenges students to a rigorous curriculum. 13. Studies patterns and relationships across time and space. 14. Fosters curiosity about new ideas and hope for the future. 15. Motivates students to act in creating a just and sustainable planet. 1. Promotes the Big Picture. A holistic approach and global perspective place information into a "big picture" in which the breadth of a subject is considered instead of just a narrow examination. For example, our holistic world history book includes hunting and gathering people and those living in small, agricultural villages who continue to practice their way of life today, as well as contemporary people manipulating information with sophisticated technology. 2. Is Interdisciplinary. Our holistic approach is interdisciplinary, which means we integrate the disciplines of history, economics, politics, sociology, anthropology, humanities, literature, psychology, religion, ecology, the sciences, philosophy, and others into the narrative. This lifts the topic of study from the narrow confines of an academic discipline into a study of the relationship of all the facets of a topic. For example, in our book on the global economy, the economy is studied in relation to society, the environment, and human well-being. 3. Provides a Framework for Understanding. Malcolm Gladwell, a noted author and thinker, has stated that we in modern society are "information rich but theory poor." I agree. We have found that students and educators today have available a treasure trove of information that they are able to easily access with modern technology. Yet, as educators have told us, this plethora of information often overwhelms students, who are left adrift without a framework for understanding it. Educators and students are drawn to our holistic approach and global perspective since it provides a framework for organizing and understanding the vast amount of information available to them. Students have a context which helps them to retain, critically analyze, and apply the information to other situations. 4. Anticipates the Long Term. When using a holistic approach and global perspective, we can better consider and anticipate the long-term impacts of actions, events, and information. For example, the Gross Domestic Product growth rates evaluate the world economy, which are often not a true indication of the actual economic performance, while the number of people starving or the effects on the environment are ignored. 5. Engages Students in the Learning Process. Our purpose in applying this holistic approach and global perspective to the subjects that we write and teach about is to more deeply engage students in the learning process. We need to use strategies to draw students into a learning process that more fully reflects the 21st century world in which they live. This means more than using the latest technology or educational tool to gather and manipulate more information; it means providing a comprehensive framework for understanding and simplifying complexity and emphasizing the urgency of the topics found in our books. 6. Inspires a Paradigm Shift. 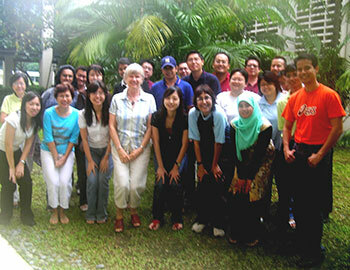 Our holistic approach and global perspective is a deliberate and thoughtful way to study different subjects. In fact, some people have remarked that they see this approach as a paradigm shift in the way we write, study and teach different subjects. There is not necessarily new information in our books, but we place existing information into a comprehensible, systematic, and thought-provoking framework. Our approach reframes existing information to encourage multiple perspectives and explore unfamiliar points of view. It lifts topics beyond the narrow confines of rigid disciplines to study the relationships found within a system. As one thoughtful student exclaimed about our world history book, "This world history is different, it is a process!"